The world is full of people writing poems. The world is less full of people reading poems. 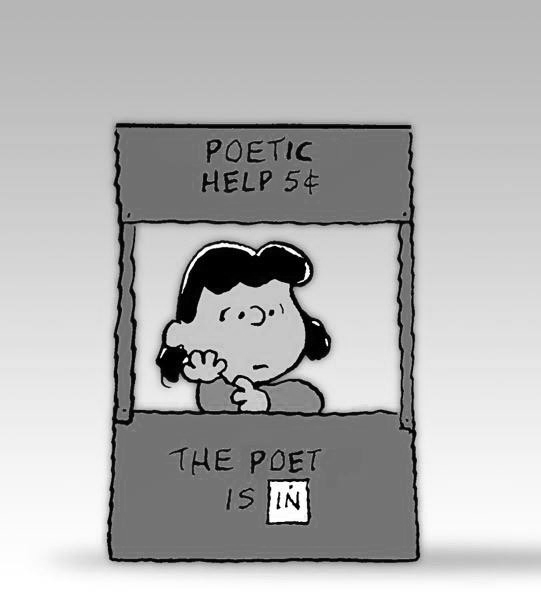 Poets read poems, but mostly their own. Thankfully, I've found a fervent audience of people who read poems but don't write them. I found this audience of readers in a weekly email quietly distributed by Vicki Hellmer, a rare bird of a woman who studies and appreciates poetry but doesn't actually write poems. She's not a professor, librarian, bookstore owner, or any of those careers you associate with "day job." She's a lawyer, and she's honoring poetry one person and poem at a time. Here's how: Every Wednesday she sends an email containing a poem, supplemented with well-researched background to deepen the reading experience. The service is free, and unintrusive. It's not slick and corporate. It's safe and nurturing, a neighborly nudge that says, "I found this. You may like it too." And usually I do. Vicki is a voracious reader and has good, wide taste. Which brings me back to me (again? already?). For a few weeks, I'm serving as "Poetry Group Poobah" (that's what one of the readers called me; I think kindly). Vicki invited me to choose poems, write some background, and share with the group. And guess what?! I've found enthusiastic readers, and many have replied with thoughtful notes about the featured poems. (Poems shared so far: Kindness by Naomi Shihab Nye, and A Secret Life by Stephen Dunn). Turns out the world is peppered with poetry appreciators. Thank you, Vicki, for quietly and earnestly sharing your appreciation of poetry. And thank you, poetry readers, for keeping poems alive and loved. It's Thankful Thursday, a weekly pause to express appreciation for people, places, poems & more. What are you thankful for today?